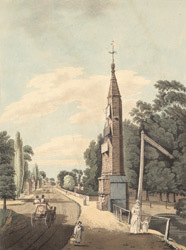 Daniel Defoe who toured Middlesex around 1719 noted: "At Tottenham we see the remains of an ancient building called the Cross, from which the town takes the name of High Cross." Tottenham High Cross is often mistakenly identified as one of the 12 'Eleanor' crosses name erected by Edward I along the route of the funeral procession of his wife Eleanor in 1290. It was actually erected sometime between 1600-1609 on the site of an earlier Christian cross. There is evidence that a wooden cross was visible on the roadside as late as 1409. It was then rebuilt in brick in the 17th century and refaced with stucco in 1809.